On the luminous Kohala Coast, Kulalani at Mauna Lani is truly a paradise. Spread over 25 lush acres along the fairways of the Championship Francis H. I'i Brown North Course, Kulalani offers resort-style living that is unparalleled. Our guests have unlimited private access to the beautiful Mauna Lani Beach Club, There is a fitness room onsite at Kulalanid fitness center, resort style pool, lap pool, hot tubs and community area with BBQ’s.You may also receive discounted rates at both golf courses that until a few years ago were the home to the masters Skins Game. 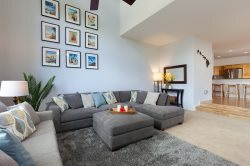 The villa is sprawled out over 2,000 square feet and features three bedrooms, two full plus one half bathrooms and accommodates up to six guests. Open-planned living makes entertaining easy. The living room features warm wooden floors and offers cozy leather recliner sofas and a large flat screen TV. There are glass sliding doors from the living room and master bedroom that opens onto a wrap-around lanai with an outdoor kitchen, a built-in Viking BBQ grill and dining table that seats four. The gourmet kitchen offers a full complement of cookware and small appliances including a regular coffeemaker, a Kuerig coffeemaker, Crockpots (large and small), toaster, rice cooker and more. There are three barstools at the breakfast bench and six seats at the dining table. Rise and shine in the immaculate master bedroom suite which offers a comfortable king-sized bed, flat screen TV and sliding doors that lead to the wrap-around lanai. The master bathroom is spacious and features an over-sized jetted tub, separate walk-in shower and dual sinks. There are two additional bedrooms that are located on the upper level; one bedroom offers a queen-sized bed and the other has two twins. There is a bathroom near both bedrooms and all bedrooms have a TV and a memory foam topper on all beds. This unit also includes; basic cookware, dishware, drinkware, coffee maker, blender, washer/dryer, hairdryer, bed and bath linens, iron, air-conditioning, wireless service, basic cable TV. There is plenty of beach gear like two beach chairs, two boogie boards, one cooler and one beach umbrella as well as beach towels for your use. The whole family will enjoy the grassy play area behind the townhome, the large lagoon pool, the lap pool and the two spacious hot tubs around the amenity center. Beach equipment is included for the 3-minute drive to the Mauna Lani Beach Club. Kayaks and standup paddleboards are available there to rent. This beach area is perfect for small children. You will want to watch the sunset from this beautiful area while sipping a tropical drink from the Napua Grill located there.